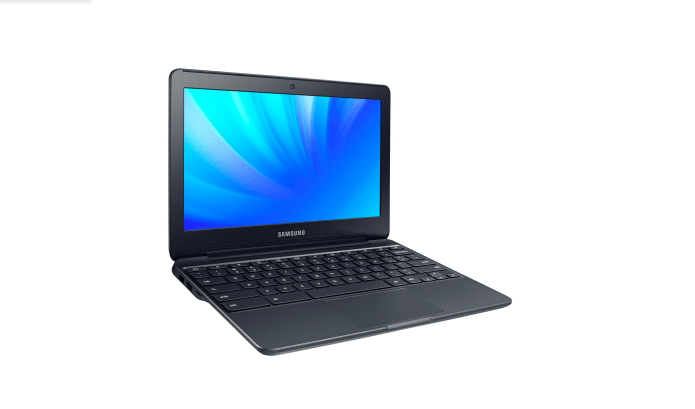 After its CES press conference last night, Samsung quietly released news of the Chromebook 3, the latest addition to its Chromebook family. The Chromebook has an 11.6-inch display, offering a 1,366 x 78 pixel resolution. It will be available with either 2GB or 4GB of RAM and both models come with 16GB internal storage. At 0.7 inches and weighing 2.5 pounds, it looks a little clunky and isn’t as sleek as some of Samsung’s other devices, but its body is made of reinforced metal, which does give it a little edge. By comparison, Apple’s 11-inch MacBook Air is 0.6 inches and weighs just over 2.3 pounds. Samsung says the reason for using reinforced metal is to make it easy to grip, but we’ll have to take its word on that as we haven’t had a chance to test it out yet. The Chromebook 3 beats the MacBook Air on battery life on paper, with Samsung saying it should last up to 11 hours with a full charge, while the MacBook air promises 9 hours. The company hasn’t said how much the new Chromebook is going to cost but it will be available early this year.